Fighting games have always been a great escape for gamers to let out their aggressions and so for this month's GOTM, I decided to give the attention one of SNK's better brawlers. For many, Samurai Shodown for the 3DO was the best way for gamers to play the popular hack n slash arcade fighter at home. Just like the awesome arcade version, you get the choice of 12 highly skilled fighters (and yes, everybody is here unlike in some other versions), each character not only had their own unique look and style to them but they also had a unique weapon as well. Samurai Shodown became popular back in it day for it's impressive graphics, awesome music, and more unique game play helped to set this game apart from most one on one fighting titles out there. The game was easily one of more impressive games for the then troubled 32-bit CD-Rom game system. Samurai Shodown takes place in the 17th century during the feudal Japan era, you get to select from of one of 12 fighters on a quest to fight one on one battles all over the world to become the best. The weapon based fighter was innovative when compared to others of its kind because the fighters can fight with or without their weapons. Some characters like Haohmaru, Wan Fu, and Charlotte can only do their special moves with their respective sword too so it's a good idea to pick up your weapon in case you get disarmed. Thankfully SNK didn't change too much from the Japanese Samurai Spirits game because many of the samurai's keep their long original names, I would have hated if the game was Americanize and Haohmaru was renamed Rick or something. The first fighter in the line up is Haohmaru, a cocky 25 year old samurai with long spiky hair and he carries his trusty samurai sword where ever he goes. Haohmaru only has two special moves but he still as a lot of power especially in his combos. He is a solid first choice for beginners and experts alike. Ukyo Tachibana is Haohmaru arch rival and he wishes to win the heart of a young Japanese girl who loves Haohmaru. Ukyo uses a long samurai sword and his attacks are quite different than most samurai's. His fear of being cut in the face means that he has his back turned to his opponent most of the time. Tam Tam is a giant 8 ft Masked warrior from the African island of Green Hell. Tam Tam looks like no fighter I ever seen in game before, his stance is weird and his moves are easy to tell but he has 4 different special moves with great range. Tam Tam is searching for a Parenke Stone stolen from his village, if it isn't returns to his homeland than the stone may destroy the world. Tam Tam was also the only character not to make it to Samurai Shodown II which kind of disappointed me but at least he's here in this game. Kyoshiro Senryo is a Kubuki actor who holds a bladed Bo to give him better reach that most warriors. Kyoshiro has four great defensive special moves but he lacks speed. Wan Fu is a Chinese Warlord looking for warriors to defend his homeland. He's a bulky 250 pound man with a giant sword plus he is the only character who could throw his weapon in an awesome air attack but his sword is lost in the process which weakens his defence. Genan Shiranui is a weird looking little green creature that has a nasty claw grove for his weapon. He can also use his special moves after he's been disarmed too which can help in his fighting strategy. Earthquake is one of my favourite characters! This guy is an absolutely HUGE 10 foot 700 pound American Ninja from Texas who leads a gang of ruthless thieves. If that wasn't bad enough for his opponents, his weapon is a scary chain and sickle. He's easily the most powerful character in the game and his weapon reach is excellent, sure he's really slow but Earthquake is so strong and big that he easily makes up for poor speed and you can't throw him either. "Yes, he is 10 foot tall!" Jubei Yagyu is a one eye Imperial guard skilled in the way of Bushido and unlike the others; he uses two samurai swords at once. He's great on defence with some very fast rapid attacks. He still loses both swords if he's disarmed though. Nakoruru is a young 17 year old girl that's a mission to save the planet after she notices the unrest of the environment. Nakoruru is the smallest fighter in the game and even her sword is fairly short but she has a huge list of moves at her disposal and even has an eagle named Mamahaha by her side that can remove her from dangerous situations or can be used to attack as well. Galford, like Earthquake, is an American ninja but he's only 5'11ft 180 pounds. He is one of the quicker fighters with tons of tricky moves like teleports and projectiles to throw players off their game. Galford even has a husky named Poppy by his side so he can use the wild dog on his enemies if he wants. Hanzo Hattori is the Japanese alter ego of Galford but he has no dog and he wishes to hind his face. Just because Galford and Hanzo look similar doesn't mean that they both have all the same moves. Hanzo has lots of defence and powerful strikes including a bouncing flame and some counter attacks. Hanzo fights to save his son from a mysterious illness. Finally there is Charlotte, a skilled fencer woman from France who's fighting in the revolution. She only has two special moves that are easy to learn but are fairly limited. Charlotte is fairly powerful especially on the ground. The graphics and music are right on and if you're familiar with the Neo Geo game then you should be right at home here. Although this is a traditional 2D fighting game like most Neo Geo games, this also game includes some 3D scaling so not only can you can see all the action from far away but the camera also zooms in when the fighters get close just like in other games like Super Smash Bros. Melee. I also found that the animation was way better than the choppy movements of the questionable Samurai Shodown 3 for the Playstation which many consider the disappointment of the series (come on, who likes that stupid kid with the umbrella, uh?). Like the grphics I really enjoyed the sound tracks in this game too. Each stage has its own background music fitting for its area like Galford has a cool rock/samurai mix or the bouncy Kubuki music of Kyoshiro's level. Each stage sounds great and it belongs on a CD. If you're Japanese then you should be right at home here because most of the fighters and even the announcer speak Japanese which was a nice change of pace when compared to the average beat them up out there. Although Samurai Shodown for 3DO is a good translation, it does have its share of problems like the action is a bit slower game than the arcade game plus because this is on CD, there is an annoying 10 second load time before each opening bout that does hurt the game's speed a bit. Also some of the Amakusa (the evil end boss) cut scenes are missing so you do miss some of the story here. This version though does have some exclusive bonus features like the ability to save three different files to the system so you can turn off the 3DO power and resume your old game for later and you have to love that, eh? The system even saves your High Scores too which really increases the replay value. It should also be noted that Samurai Shodown on 3DO is uncensored, all the blood is here right down to the massive spray of red stuff coming from a beaten opponent to the Mortal Kombat like cutting the loser in half after a random strong strike and not even the US Neo Geo home cartridge version has that. If you don't want to see the Blood and Violence in the game then you can easily shut it off in the options menu plus you can turn off other thing like too like the weapons and the time limit. This is definitely the best version of the SNK classic here outside of the original Neo Geo edition and it easily puts the 16-bit versions to shame! Samurai Shodown even surpasses all the other 3DO fighters like Way of the Warrior (good but low budget looking), Shadow (pure gaming crap), Primal Rage (solid but limited action with only 7 dinosaurs), Rise of the Robots (even worse than the Super Nintendo game with unresponsive controls), and even Super Street Fighter II Turbo (a great translation but I still liked the swordplay in SS better). 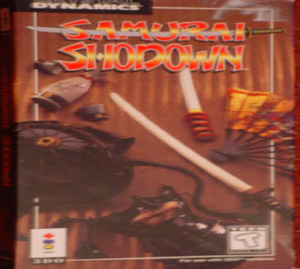 You get 12 different samurai's and other warriors with vicious weapons and furious arcade action with great graphics and awesome music that's overall sure rare for a 3DO game. What more could you want?